Members of the Palmetto Jazz Band performed at Longwood Plantation’s sixth annual “Rock to Remember” fundraiser. The event supports the South Carolina Alzheimer’s Association and has included music from the band since its inception. Residents of Magnolia Place at Longwood Plantation enjoyed a day of music and merriment as part of a fundraiser to support the South Carolina Alzheimer’s Association. 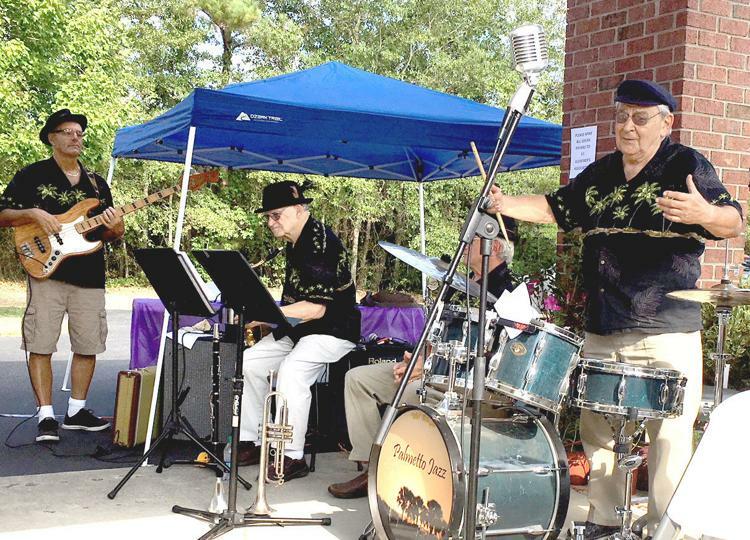 Magnolia Place, a special-care residence designed exclusively for Alzheimer’s and memory-impaired individuals, held a “Rock to Remember” fundraiser from 9 a.m. to 5 p.m. Monday, Sept. 10, at the site at 1687 Longwood Drive in Orangeburg. “This is our sixth year. We just spend all day out here rocking in rocking chairs to raise money for the South Carolina Alzheimer’s Association. We have entertainment all day, refreshments, a silent auction, and some crafts that residents have made that we have for sale,” said Carol Livingston, activities director at Longwood Plantation. Two official rocking chairs were rocked in all day, with other rocking chairs provided for people to come and support the effort. People could sponsor a rocker, make a donation or come rock with the group. Livingston said the funds go toward supporting research, respite care and education statewide, including the local region. “In five years, we have raised over $23,000. I am very pleased. Residents just take such pride in the day and what they’re doing,” Livingston said. Longwood Plantation residents Virginia McAlhany and Catherine Bradford were among those attending the event. Bradford collected donations, while McAlhany had several dish and wash cloths that she made and put up for sale to support the cause. “It’s for a good cause. I made those dish cloths and his-and-her wash cloths. I’m glad to contribute to the cause. My daughter also crocheted a baby afghan. They have some pretty things out to be auctioned off.” McAlhany said. She said the “Rock to Remember” fundraiser is lots of fun. “I was here last year for my first time and I wouldn’t miss it for anything,” McAlhany said. Longwood Plantation resident Lavonda Sandifer said she also enjoys the event. Cordova resident Jeanette Jeffcoat, whose mother is a resident of Magnolia Place, said the fundraiser is indeed an important one, including helping to brighten the day of residents. “I think an event like this just really makes their day. They love people … and they love being a part of what’s going on. They have so much for them to do at both places… I know when my mom is here that I don’t have to worry about her. That’s the big thing for me,” Jeffcoat said. Daphne White, a 15-year- employee of Longwood Plantation, has been attending “Rock to Remember” since its inception. “It’s a lot of fun, especially in giving the residents something to do,” said White, who works in memory care. She takes pride in the cause the event supports and the care she gives to seniors. “I just like taking care of the elderly. Ever since I did my first clinical for my CNA class, I loved it from the start,” White said.